Robust wall basket. Made from heavy duty rim wire. Ideal for use with moss or co-co liner. Robust hanging basket. Made from heavy duty rim wire. Green coated metal wire basket. Extra strong and heavy duty wire trough out the basket. These flower baskets come complete with quality Co-co liner. Green coated metal wire hanging basket. Extra strong and heavy duty wire trough out the hanging basket. Comes complete with galvanised chains with no tangle S-hook attachments. These flower baskets come complete with quality Co-co liner. This gothic style is made from strong wire construction in a distinctive arched style. These baskets are deep giving better plant growth. These wall baskets are finished using a black power coated epoxy finish. Comes complete with a quality Co-co liner. These troughs are deep giving better plant growth. These wall troughss are finished using a black power coated epoxy finish. Comes complete with a quality Co-co liner. This gothic style baskets is made from strong wire construction in a distinctive arched style. This square design gives distinctive look. These hanging baskets are finished using a black power coated epoxy finish. Comes complete with a quality Co-co liner. This flat bottom design gives distinctive look. These hanging baskets are finished using a black power coated epoxy finish. Comes complete with a quality Co-co liner. 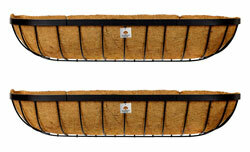 Replacement co-co liner for Gothic flat bottom basket, pre-shaped, made from co-co fibres. These Victorian styled window box features delicate, petal shaped rims and hand tied wirework detail. Come with coco basket liner. Can also be used without liner to hold small pot plants. These Victorian styled window box features delicate, petal shaped rims and hand tied wirework detail. Come with coco basket liner. Can also be used without liner to hold small pot plants.. These Victorian styled window box features delicate, petal shaped rims and hand tied wirework detail.Come with coco basket liner. Can also be used without liner to hold small pot plants.. These Victorian styled hanging basket features delicate, petal shaped rims and hand tied wirework detail. Comes complete with coir liner. 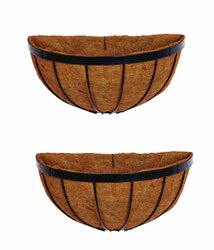 Size: 36cm diameter x 20cm height of basket. This Victorian style hayrack planter has a decorative scrolled back panel with a verdigris effect finish. Delicate scrolled detail around the rim of the hayrack. Comes complete with Co-co liner. This hanging basket has a lattice style top section combined with elegant look. These hanging planter are made from heavy duty wire with a traditional rust effect finish for weather protection. Matching window boxes in this design also available. This window box has a lattice style top section combined with elegant look. These planter boxes are made from heavy duty wire with a traditional rust effect finish for weather protection. This box planter is hand welded to give a long lasting wall planter. These windows boxes have a lattice style top section combined with elegant look. 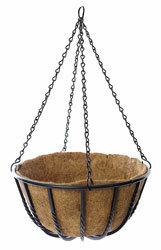 This wall basket is made from heavy duty wire with a traditional rust effect finish for weather protection. This plant box is hand welded to give a long lasting metal basket. These windows planters have a lattice style top section combined with elegant look. 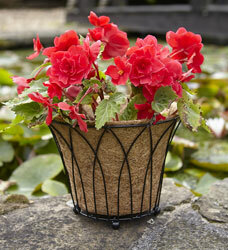 These wall baskets are made from heavy duty wire with a traditional rust effect finish for weather protection. This hanging planter is hand welded to give a long lasting window planter. These flower hayracks planters have a lattice style top section combined with elegant look. 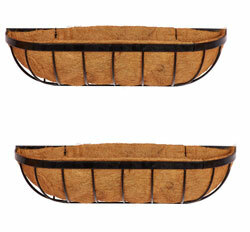 These wall baskets are made from heavy duty wire with a traditional rust effect finish for weather protection. This hanging planter is hand welded to give a long lasting window planter. 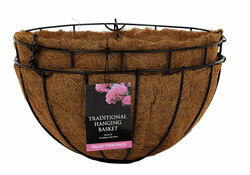 These flower hay racks planters have a lattice style top section combined with elegant look. 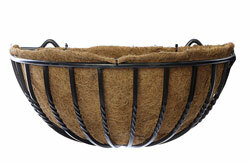 These wall baskets are made from heavy duty wire with a traditional rust effect finish for weather protection. 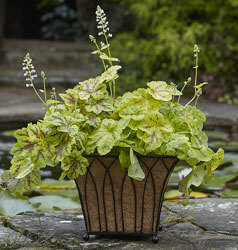 This wall basket planter is hand welded to give a long lasting window planter.